Located almost an hour and a half west of the Wichita metro area, Pratt, Kansas is nestled into the vast patchwork of farmland that comprises much of Kansas and the Midwest. At over 6,000 residents, the city is larger than its surrounding towns and is positioned at the nexus of US-400, US-281, and Kansas Highway 61. Ultimately, the confluence of all of these factors presented Pratt Regional Medical Center with the opportunity to fulfill an important niche as a regional healthcare provider to its broader community. During our major renovation and remodel of the facility, Health Facilities Group appreciated that the hospital needed to become a destination for quality healthcare services. In particular, HFG understood that Pratt Regional Medical Center’s Family Birth Suites would be competing against hospital systems in the larger Wichita area. By delivering a state-of-the-art product to Pratt, HFG ensured that the hospital offered competitive services and empowered it to leverage its closer location to attract nearby patients who might otherwise have sought healthcare in a larger metro area. From the canopy that overhangs an entrance to the efficiency of mechanical systems, hospitals thrive when they successfully leave holistic impressions that are inviting and professional upon their patients. Health Facilities Group led the planning and design of a major, 110,000 SF addition and renovation at Pratt Regional Medical Center. The project management team incorporated a Lean Design process that guided plans for this complex, multi-phased renovation and addition of all inpatient and outpatient departments. This included a reorganized site layout; a new main entrance and lobby; pharmacy; new patient rooms designed to current regulations; and an expanded Emergency Department. 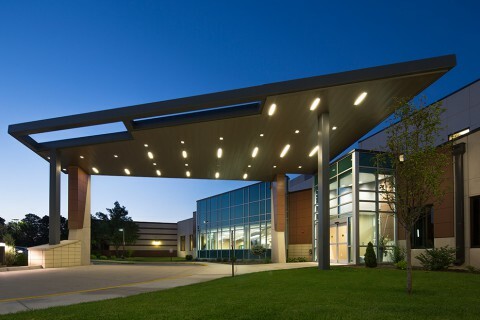 The scope of this work included designing completely new systems, including a mechanical system with high efficiency water-cooled hydronics; an electrical system with LED lighting and indirect light for glare control; and a medical system with state-of-the-art nurse communications, paging, central scheduling, and medical gas infrastructure. All of these major additions and renovations were completed while the hospital remained operational. HFG’s strong leadership and experienced specialists make it well suited to coordinate and drive both complex and technical projects.